After 28 years in banking, I decided to retire and move to Mexico Beach on a permanent basis. I am originally from Albany, Georgia and I have been coming to Mexico Beach fishing and enjoying the beach since the early 90’s. So, I knew where I wanted to retire and live. I bought a place here in 2002. I retired in 2009 and became a full-time resident of Mexico Beach. Being retired is nice, but I have always been a person that had to have something to do and a place to go besides fishing. 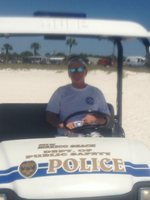 So after being retired for approximately 2 years, I had the opportunity to become the Beach Patrol Officer in Mexico Beach. It was a great job since it involved meeting and talking to people. I am now the Code Enforcement Officer and a member of the Volunteer Fire Department at Mexico Beach. I enjoy being involved in the Community. I was a bank regulator for the State of Georgia, and I not only regulated state chartered banks, but state chartered credit unions and mortgage lenders and brokers as well. After regulating mortgage lenders and brokers, I became interested in real estate and became a licensed real estate sales associate in 1998 on a part-time basis and I still maintain an active license in Georgia. After living here permanently for over 3 years, I decided to get active in real estate in Florida, and decided to join 98 Real Estate Group because of their thorough knowledge in the real estate market in this and the surrounding areas. Give me a chance to be your Realtor. I look forward to working with you!